Located just a stone’s throw from St Paul’s Cathedral and with the nearest tube being Mansion House, Vinyl Bar takes up a great spot wrapped around the corner of Old Change Court where back many moons ago Henry III set up a central collection point where items of gold and silver could be exchanged for coinage. The Vinyl bar is located on this spectacular site and is owned by Multi Millionaire Business Owner Alfie Best, exchanging coinage for food, drinks and entertainment now. Vinyl Bar opened it’s doors officially 3rd February 2017 with a complete refurb. You are welcomed into the warm reception area which has an entrance to the ground floor bar, dining area and live lounge where there is a small stage which is perfect for guest speakers and solo artists to perform. The reception area also has a sweeping staircase to the first floor where a hidden gem awaits full of luxury decor and vibrant colours which brings the venue to life even more so. A huge area awaits upstairs large enough to fit 500 people, there is also a main stage for live bands and lush VIP seating areas for of course the….VIP’s. Without question, The Vinyl Bar’s lively atmosphere is the thing that really stays with you. The sound of fabulous music and bursts of laughter that come from both floors will make you feel like you’re at home playing your favorite music with your own group of friends. The bar pours out ambient light and fills the floor with a chilled and relaxed mood but at the same time you just want to get up and dance to whatever music is playing. And that’s the real secret behind the venue’s success all ready. From the list of live bands, the DJ’s playing your favorite tune, the stunning decor and delicious food, you’d think you were in your perfect venue…. Ah well you are! The Vinyl Bar does a fantastic job by serving cocktails, great food, live music and the wonderful atmosphere that comes with it. Think of it as a five-star music venue crossed with a laid-back place to meet your friends, have a laugh, a dance or even in the day time when it is a little quieter a place for business meetings. 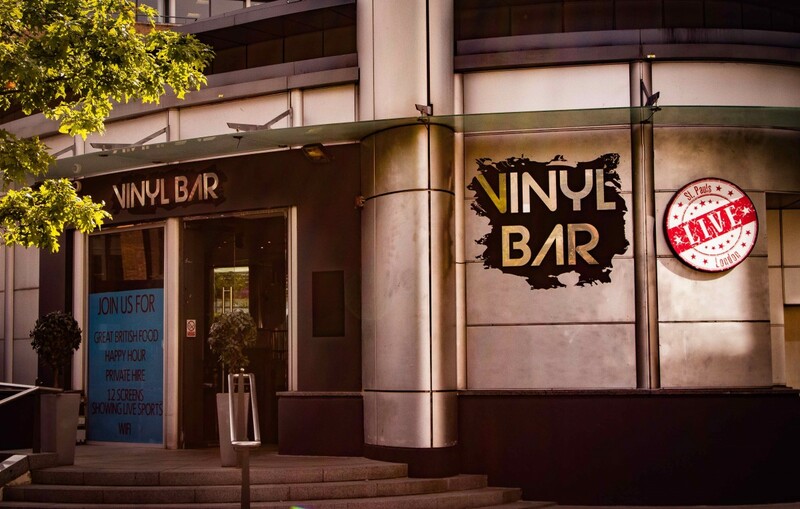 Vinyl Bar Live is our second unique venue in the heart of the City where you can come to either have a business lunch, enjoy a few drinks after work with your colleagues, watch live sports or watch a live music performance from London’s best up and coming artists & DJ’s Monday to Sunday. Whether it’s the Barclays Premier League, the Olympics, the Formula 1 season, Wimbledon, Rugby, Darts or the World Cup, some sporting events were meant to be experienced on a grander social scale than in your living room – Vinyl Live is the only place to be. We have a great selection of beers, wines, spirits, champagne and cocktails available and don’t for get our happy hour from 5pm – 8pm every day.